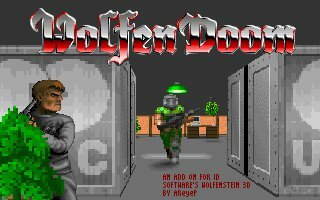 "Wolfendoom" started out as an add on for the original full version of id software's Wolfenstein 3D. little more than sit forgotten on some back up disks for the next few years after that. id software) to create even better add ons, I decided it was time to give "Wolfendoom" a bit of a facelift. now a proper total conversion of the original Wolfenstein, rather than just an "add on". and storyline blend together to make something akin to a new game altogether! opened up inadvertently by UAC Research personnel. The full story is available from the main game menu, and unfolds as each episode is completed.